At last I have photos of what I wore to London Fashion Week (part one). I’ve been back most of the week but it’s taken me till now to catch up – I don’t know how bloggers manage to publish their photos next day; I’m always about a week behind with all my outfit posts (and I blog full time). I apologise for my tardiness…! These photos were very kindly taken for me by my “LFW BFF” Anna Elliott – she’s captured my sequinned Topshop kimono beautifully (thanks Anna)! I did buy it with the intention of wearing it to Fashion Week, but honestly had no idea how I was going to style it. As it’s such an OTT piece, I decided to do dressed-down but also practical for February in London for the rest of the outfit: a super thick cowl neck sweater for warmth (which dispensed with the need for a coat or scarf), my distressed boyfriend jeans and my high – but comfortable – black ankle boots. Of course I couldn’t go to LFW without my recently-acquired Maxwell Scott Birkin style bag, which I think has the potential to be the most hard-working accessory in my sartorial arsenal. So I was comfy, warm and sparkly; that, to me, is LFW heaven. I have two more fashion week outfits to publish on the blog, so watch this space. Meantime, check out some of the beautiful kimono picks I’ve selected (at the bottom of the post). Are you also loving kimonos as outerwear? Anyone doing sequinned or sparkly like me… Let me know! 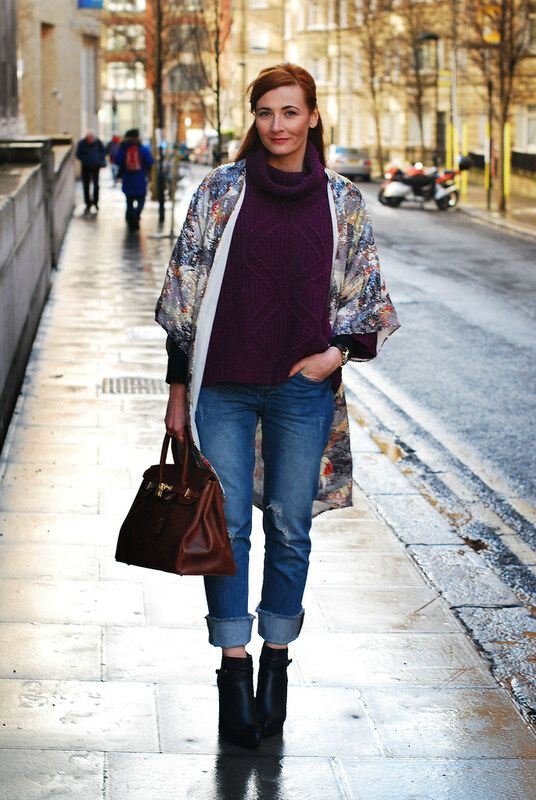 The kimono with the boyfriend jeans is so effortlessly chic! Plus, your hair color is so pretty! A beautiful kimono. I love kimonos, have a real Japanese antique one and some kimono like tunics. Never would have thought of wearing it in winter as a coat. No matter how warm the sweater was. And I also get cold if I look at your ankles. Still.. The picture is good and that is what it is all about. 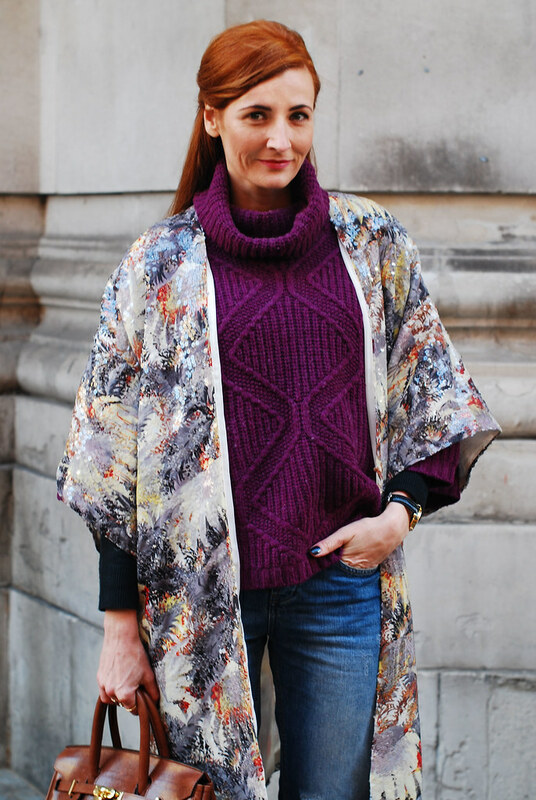 I love that sweater paired with that beautiful kimono…so pretty! I'm going to be featuring you on Sunday Style tomorrow…be sure to come check it out! Love the outfit. Kimono is gorgeous. And such a great idea to pair it with the knit sweater. Love it. And that bag….oh…gorgeous. Love that outfit! So casual, but so put together! Love it! I co-hosted the linkup this week – thanks for linking up! Wow! Congratulations on winning the modeling contest! Can't wait to see the pics! This outfit with the kimono is AMAZING! I love the mix of casual & fab! So happy you won and I was a part of that! Star voter ….. I LIKE! That looks really great. I love the different colors, who fits perfectly together. And it's fantastic: The bag have the same color like your hair. I love turtle neck and kimonos! There currently my faves right now. You definitely have chic style! Firstly thanks for the kimono inspiration. I have one but have had no idea how to style it…You look gorgeous. Great styling. Attending fashion week sounds wonderful, but may ask you if you stress over your outfits at all? I imagine if you allow it, you could feel quite pressured over what to wear? Im looking forward to seeing what else you wore during the week. And huge congratulations on the competition. Yes there is the "OMG what am I going to wear" problem, but if London had great weather then it wouldn't stress me as much – I actually stress more about having sore feet, getting wet or being cold!! All the factors of weather, travelling and *then* what to wear make it stressful… but I do get to the stage that if I'm not feeling as 'fierce' as everyone else looks (and believe me I do feel that way when I get there and see what everyone else is wearing), then I just think "whatever"!!! Once you're there you can't do anything about your outfit to change it, so I just stop worrying once I'm there and enjoy the sight of wonderful clothes all around me! London fashion week, how fantastic! I love your kimono, it's badass and brilliant the way you've styled it. I look forward to seeing photos from the modelling competition you won! Heehee badass – like it Bri :))) Yes look out for the photos, I can't wait! This look is just fabulous Catherine. I love it. You really are a master at mixing textures! Aww that's so nice of you Courtney – thank you! Super cool Catherine, love these colors on you! Fun outfit to wear to fashion week. Kimonos are so stylish and you wear this look beautifully. 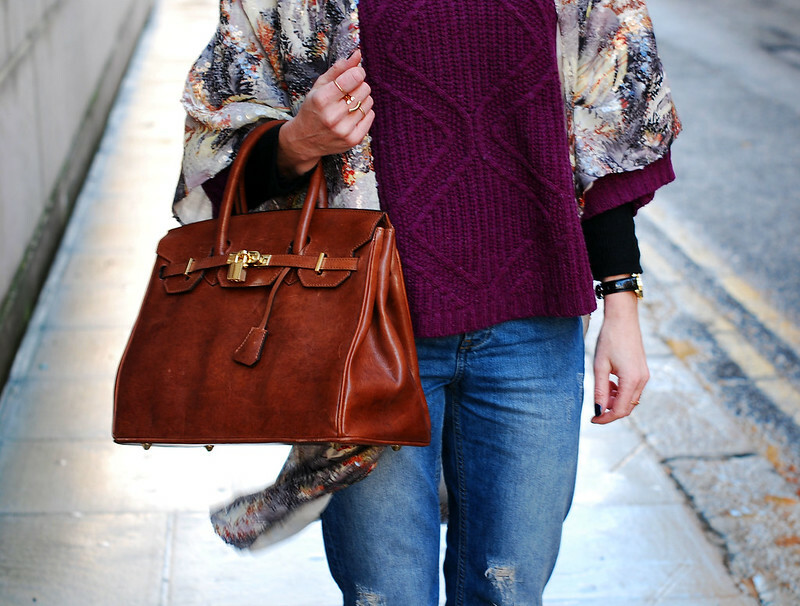 Loving that kimono and Birkin style bag on you. What fun to go to fashion week in London. Swoon! I love your look! Kimonos are so effortlessly cool! This sequinned one is all the more gorgeous it is sparkling! I love that kimono so much…would wear it in a heartbeat! This is a fun look and I think perfect for fashion week! Love that sweater with the kimono! Love it! I adore kimonos and yours looks fabulous!